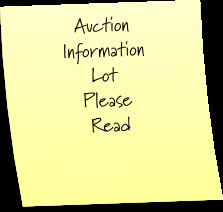 Successful bidders need to make contact with S&S Auction on February 27th to arrange payments and schedule pickup. Lots are located in multiple locations, see bottom of each lot description for the location of the lot. S&S Auction Still Believes That Honesty & Integrity Are Mandatory In All That We Do. We work hard to ensure that you get the maximum return on your equipment. You've Earned It.